Above is a photograph of a cushion cover that I made. My daughter’s friend had a birthday a while back and I needed a quick present for her. I didn’t have time to go out to buy anything special, so I decided to make her a present with things that I already had lying around in the house. I chose to upcycle again. I had some lovely yellow material, which was from an old child’s quilt cover. I had a spare cushion too so I decided to use this as stuffing for the cushion cover. I made this project as an all in one, meaning I didn’t leave an opening to remove the cushion cover. I used the cushion that I was using as a template. Once I knew the size of the cushion, I then made a pattern on paper, but with extra so that I would have a wide edge all the way around the cushion. For the front I used two pieces of material and also used another choice of material to make the applique letters that I attached. The back was just one sheet of the same material. I printed the name onto the computer and then printed the individual letters out onto paper. I then cut these letters out of the paper and placed them onto the material I was using for the appliques. I then cut out the letters from the material and placed them onto the middle of the cut out cushion cover. I pinned these down and then sewed these letters on using a zigzag stitch. I won’t go into details about how I put the rest of the cushion together, I probably didn’t do it the correct way, because I didn’t copy from a tutorial. I just made it up as I went along, but the outcome was great, so I am not complaining, Normally I will follow a free tutorial that I find on the internet, but I couldn’t find one suitable this time. You could just buy an ordinary pillowcase and unpick the edges and sew on some appliqued letters. 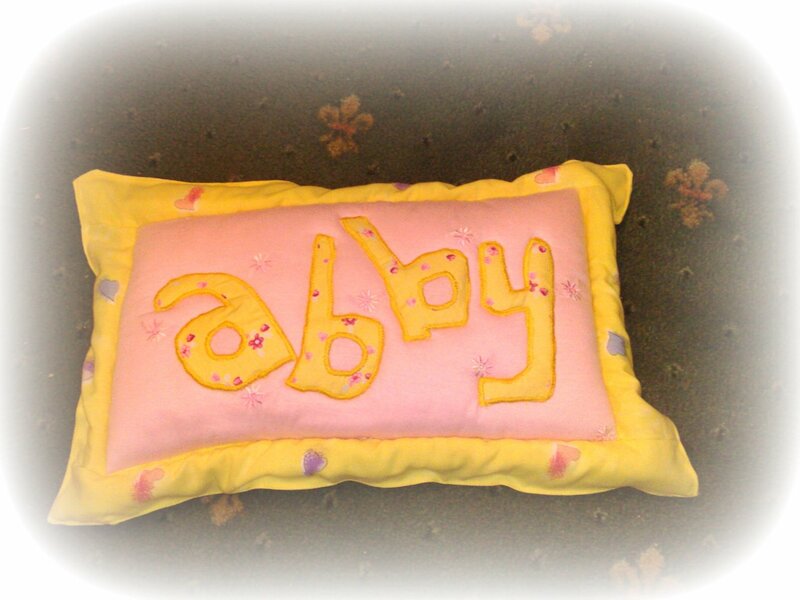 Once you have finished sewing the letters on you can just machine stitch the edges again! Quite simple really. I liked the idea of giving the present with a cushion in it, just so that they can use it straight away. Kids love to get things with their names on, and even us adults too!